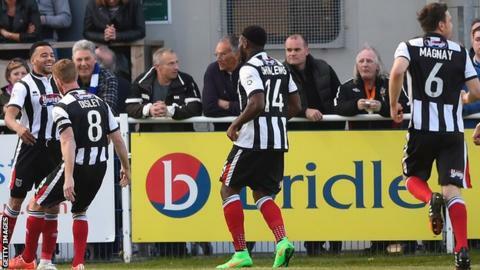 Nathan Arnold's superb double gave Grimsby the advantage over Eastleigh in the Conference play-off semi-final. Grimsby took an early lead thanks to Arnold's 25-yard half-volley. Ollie Palmer hit the post as they sought a second goal, while Eastleigh's best chance of the first half saw Jack Midson denied by James McKeown. Substitute Yemi Odubade levelled when he tapped in from close range, before Arnold's flick and volley sealed the win for Grimsby. Eastleigh goalkeeper Ross Flitney, who had earlier saved a close-range effort from Arnold, made a stunning stop to keep out Lenell John-Lewis to keep the deficit at one ahead of Sunday's second leg. "We didn't play as well as we could do tonight, we just needed another boost after scoring the goal. "It was a tough tie and we've just made it a little bit tougher. "It was a tight, quick, high-tempo game and that's what we expected." "It is a great result but I would have liked us to have played better. "It's the sternest test we've had, certainly against Eastleigh in three games as it is now, and we will expect another one on Sunday. "I hope whatever team we select, we know we can take that first step to going one better and achieve what we want to do." Match ends, Eastleigh 1, Grimsby Town 2. Second Half ends, Eastleigh 1, Grimsby Town 2. Attempt blocked. James Constable (Eastleigh) left footed shot from outside the box is blocked. Offside, Grimsby Town. Jack Mackreth tries a through ball, but Jack Mackreth is caught offside. Attempt saved. Lenell John-Lewis (Grimsby Town) left footed shot from the centre of the box is saved. Attempt blocked. Brian Howard (Eastleigh) left footed shot from outside the box is blocked. Nathan Arnold (Grimsby Town) is shown the yellow card for a bad foul. Attempt blocked. Yemi Odubade (Eastleigh) left footed shot from outside the box is blocked. Attempt blocked. Craig Clay (Grimsby Town) right footed shot from outside the box is blocked. Goal! Eastleigh 1, Grimsby Town 2. Nathan Arnold (Grimsby Town) right footed shot from outside the box to the top right corner. Assisted by Lenell John-Lewis with a headed pass. Attempt saved. Craig Stanley (Eastleigh) right footed shot from outside the box is saved. Attempt missed. Craig Disley (Grimsby Town) header from the centre of the box misses to the left. Assisted by Scott Brown.